Marigold is a common annual flower that blossoms throughout summer and fall. It brings vibrancy and color to many homes and gardens for months. In some instances, it is planted in pots or around other herbs to repel pests. While Marigold flowers are great for ornamental purposes, they have much more to offer apart from their color and vibrancy as they are edible and highly nutritious. Unknown to most people, Marigolds pack a big punch for their size in the nutritional world. Elson Haas, author of “Staying Healthy With Nutrition” says that Marigold flowers contain more zeaxanthin and lutein compared to popular vegetables including spinach, collards, and kale. In addition, a study conducted by the University of Maryland Medical Center shows that Marigolds contain highly beneficial compounds known as phytonutrients, antioxidants, and flavonoids which lower the risk of developing cardiovascular complications. Marigolds have a long and revered history. Ancient Aztecs considered them as magical flowers and used them extensively for medicinal and religious purposes. While ancient Greeks used the flowers for food or to decorate food, it is the Indians and Pakistanis who popularized their culinary and aesthetic purposes. Basically, edible Marigolds have a mild citrusy to spicy taste. Popularly known as the poor man’s saffron, these spicy flowers can be eaten raw, fresh, blanched or dry, sweet and savory. To prepare edible Marigold, pull whole petals from the stem and cut off the heels as these give a bitter taste when consumed. Marigold petals have been used since time immemorial to alleviate stomach cramps, period pains, and digestive problems. To make Marigold tea, put the petals into a pot of freshly boiled water, let the mixture steep for about 5 minutes and strain out the flowers. After straining, you will be left with beautifully colored tea. You can either drink the tea without any additives or add some peppermint leaves which have little color to boast of but packs a wonderful flavor. Dried and crushed marigold petals are used to make what is commonly referred to as the poor man’s saffron. The petals give a unique and spicy flavor to bread, casseroles, and omelets. 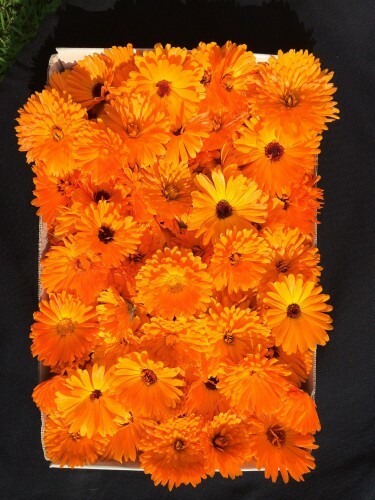 Marigolds are easy to find or grow as they have few pests compared to other edible flowers. They also have a subtle peppery flavor which pairs nicely with green vegetables. Marigold petals can be stir-fried alone or alongside other vegetables to add zip to meals. They also add color and flavor to soups, rice, and stews. Ultimately, while Marigolds are beautiful to behold, they are so much more than just ornamental plants as they pack a big nutritional punch! Marigold is a common annual flower that blossoms throughout summer and fall. It brings vibrancy and color to many home and gardens for months. In some instances, it is planted in pots or around other herbs to repel pests. While Marigold flowers are great for ornamental purposes, they have much more to offer apart from their color and vibrancy as they are edible and highly nutritious.